As it can be seen on my signature, I not only have 1:12 scale car models, but also real ones. After making for many years the 1:12 Olds Toronado, I had enough. Almost by accident, I found people in the region where I'm living who had US cars from the fifties. At that time, I just drove an US car I bought new: a 1980 Oldsmobile Cutlass Calais, but I would never had the courage to think about a restoration without the "help" of those young men. 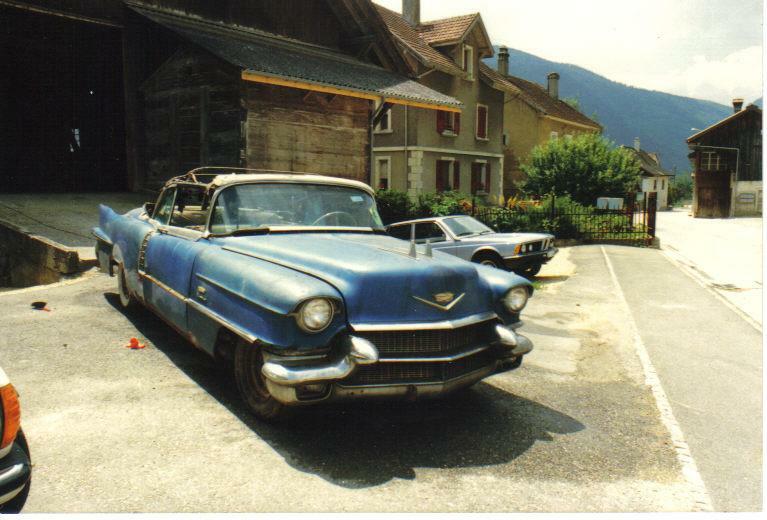 After a while, I bought a 1956 Cadillac Sedan de Ville in a garage near Geneva (Switzerland). It was not entirely finished when a 1957 Cadillac Brougham came home. Closed cars are nice, but convertibles are nicer! (at least it was my thinking). A friend from England a Mr. Bedford (yes, yes!) told me once that he knows somebody who is importing cars from the US, mainly to sell them in Sweden of Finland. At that time, among other cars, he had a 1956 Cadillac Biarritz. After some discussion with the seller, I paid the car and ask a Swiss company to transport it to the village where I'm restoring my cars. I will relate it that story from the arrival to the completion. I had 7 years to restore it, but that report will not take so much time to be published! 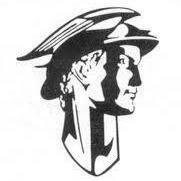 This story was published first for 10 years in the CadillacLaSalle forum. I will adapt the text if necessary. Please understand that all pictures are scans from paper pictures; therefore their quality is not the best. I bought the car unseen; it was in transit in England, coming from Virginia. As I had already at that time (1986) a '56 Sedan de Ville, I was not too anxious as I had a good base to look at, even if some details are different. So, I did the gamble; however, it was more like Russian roulette with just 1 missing cartridge. I mandated a transport company to pick up the "car" from England and to deliver at the village where I have my shop. The first picture was sent by the seller, it was taken in Virginia. The second one show the thing at arrival. After the triumphal arrival, a friend was kind enough to tow the "car" through the village. The drive did not stay unnoticed by the inhabitants! 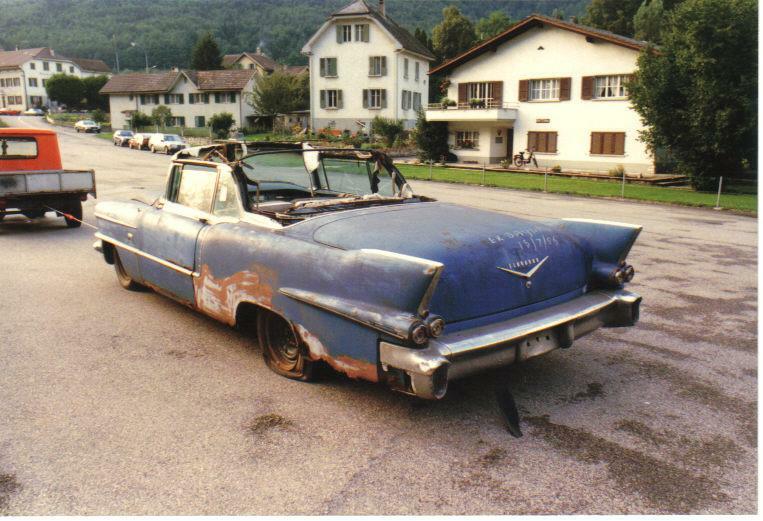 I could not begin immediately with the work on that ruin: I had first to finish my '57 Brougham. I have a feeling this is going to be another fantastic journey, thanks for allowing us to go back in time and join the fun!!! That's quite a beautiful town, too, not to mention a great car. Thanks you, faithful followers! I just hope that my way of telling the story will be entertaining, despite my English limitation; I hope that Pat will not be disappointed! This time, the story will be like a book: I means the story is all there, but you cannot go to the last page to see if the hero is still alive! I will just put a bit at a regular basis, just to keep the interest. 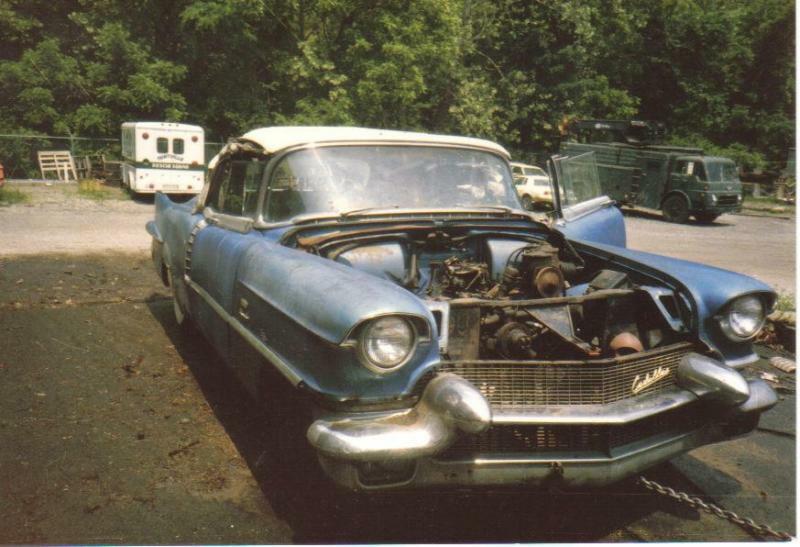 To John: the '56 Cadillac color was called Bahama Blue. The paint from the Mark II is darker and it's (but don't tell further) a VW color, a company for which I have no great sympathy, but that color was the best for my taste. This time, the story will be like a book: I means the story is all there, but you cannot go to the last page to see if the hero is still alive! Well, we all do hope the hero is still alive at the end of the story! When I had enough with the trouble the Brougham gave to me, I cleaned the mess from the floors and did a first inspection. It was not glorious: the radiator was missing, the engine was from 1956, but not the correct one. 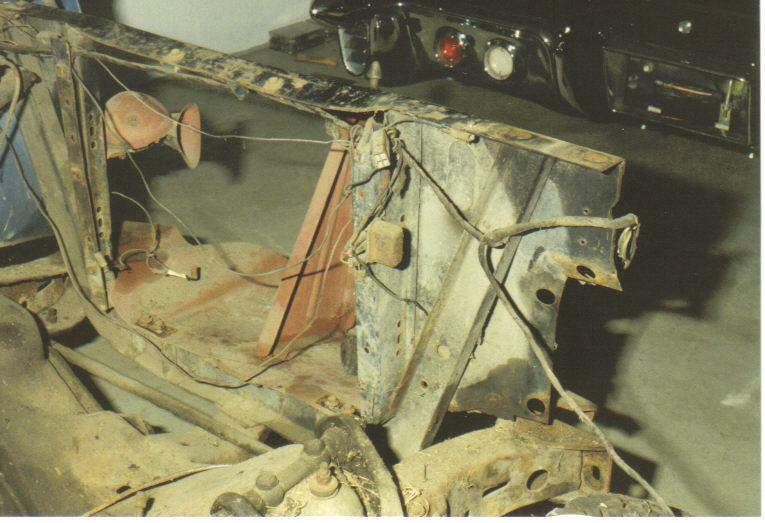 It never ran in this car: the studs from the front supports were not in the frame's holes, they were on the frame! The engine transplant was not done without damage: the radiator support was bent. The condition of the transmission was unknown; anyway, according to the plate, it was not the right one: it was for an engine with one carb. At that time, I had no idea how to repair that disaster and I could not weld. In retrospect, that rust bucket was a relative good base, compared to cars I saw later which were worse. I was just not prepared at that time to see so many holes. The issue is easy to guess; he was just older and poorer! Thanks for that - it made me giggle! By the way, they are not rust holes they are 'golden body lightener'! It's not always easy to let giggle an older person, I'm glad I coud do it! Your interpretation about the holes is what differentiate somebody trying to make a story in a foreign language from somebody mastering that language! Roger, I guess you made up your mind and decided to dive right in and start working on it. You must like to stay busy. Wish you luck on your future project. At least you don't have to deal with sanding and painting a roof. I admire that you can actually write very interesting reports in a foreign language. Being in Switzerland, is your 'normal language', German, Italian or French? Am I correct in assuming all three languages are spoken in Switzerland? Being, schooled in England in the 1950's, the only language I learnt was English. Keep up the good work and I hope you manage to remember some interesting stories from the Cadillac restoration. Martin, this an old story! I bought the car in 1986 and yes, I did restore it, finishing the job in 2001! Oh, I guess I'm a little behind the ball . Roger, do you have any thoughts on the pacing of your posts for the story? I wouldn't mind if it went fairly slowly. You say it took 15 years to restore the car and while I don't think I want to wait that long... I could wait a year or so for the story to be played back out. I think I'd rather it went more slowly than quickly. Maybe one or two posts a week? I was born in the French part of Switzerland. We had German the last 3 years at school but in the German part of the country, people are speaking Swiss German (sort of slang). With the school German, I understood nothing. When I began to work at GM in 1970, I had to bite the bullet and "improve" my German knowledge. I would say I'm understanding most of what is said, except what is spoken in some Swiss regions; their slang is just not understandable to me. I'm sure you have similar situation in England; not everybody is speaking the Oxford English! Due to my interest in US vehicles, I began to buy US magazines when I was 19-20 years old. I understood the pictures perfectly, that's was all! With the time, it improved; one decisive factor was when I went a long time ago for vacation in California: I was alone and had to make the effort to understand and speak. I still have difficulties to understand English speaking people over the phone, depending the region they are coming from. Fortunately, I understand almost everything in print! Sure Jeff, I will not wait that long to tell the story! One or two posts per week is reasonable; it will be over probably middle this year. 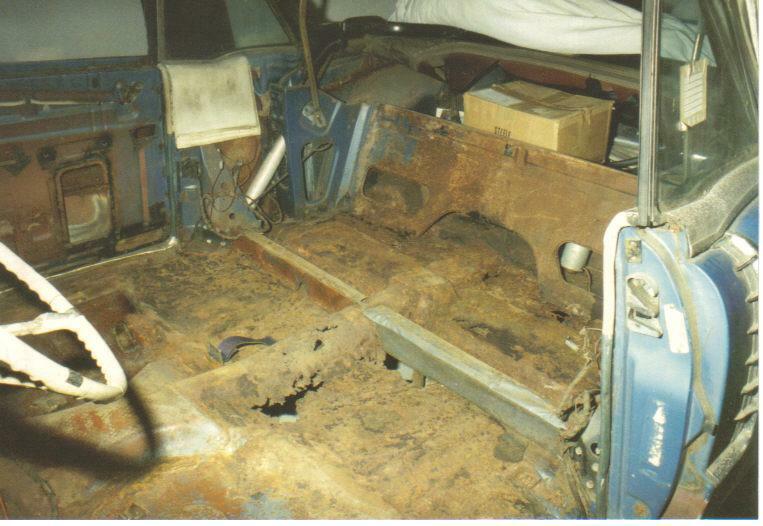 In fact, I had 10 years to restore the car. When I bought it, I still had the '57 Brougham to finish; when I had enough with the Brougham (it was a very difficult car to restore), I began to remove parts. The real work began in 1991. Roger, 6 months sounds great! I know a lot of people these days like to "binge" watch things and finish whole seasons of a show in a few weeks, but I'd rather enjoy your story over 6 months rather than 6 weeks. 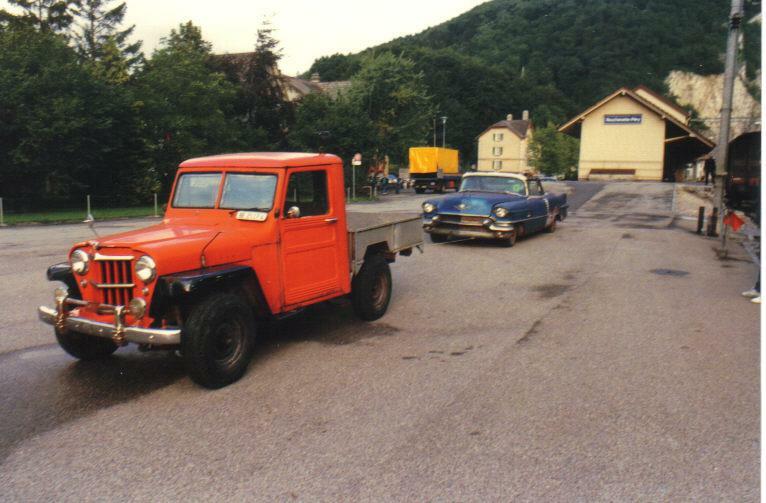 Of course, I had to take a decision: the car was there, totally mine and at that time, with transportation and customs, too expensive to throw away (about CHF 10'000.- or $ 10'000.00). Resell parts? which ones? there was nothing good, except the outside windshield's moldings. Anyway, I did not bought that scrap on basis of the pictures alone: the friend in England, Don Bedford, let send an inspector from AA Technical Services to see the car, at my expense, of course. 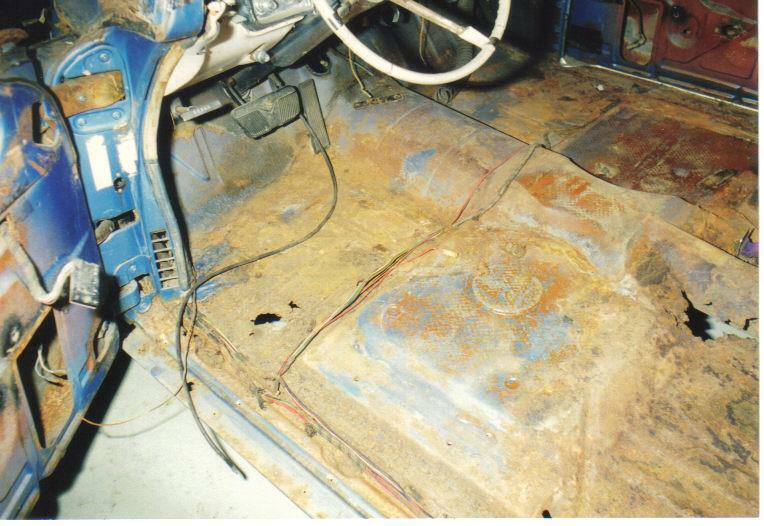 "As can be seen from the contents of this report, the main structure of the car is sound, with very little damage other than corrosion and general deterioration to the body work" This inspector was also a very optimistic man! 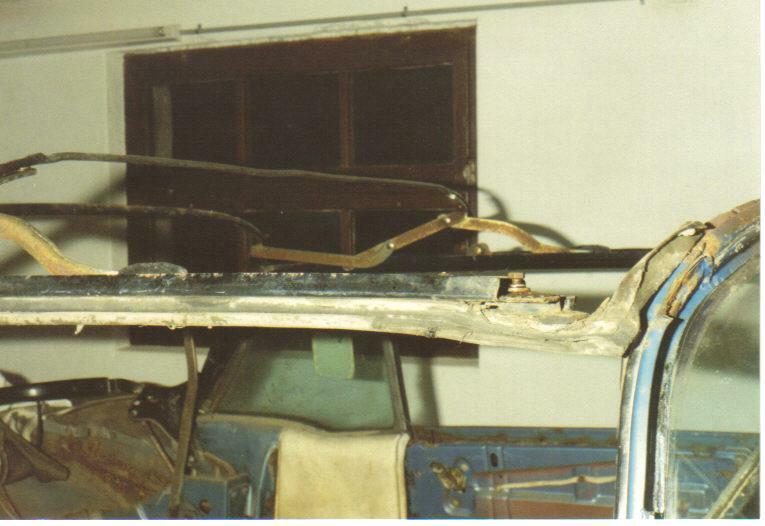 Over the years (the Brougham was not yet completed), I began to remove parts. As I lost my game, I had to assume: therefore the thing will be a car again. The next few pictures are from 1990. The roof structure was not bad, however, some work was needed to get it to MY standard. Thanks Ron! Fortunately for most, it will be quicker than for the scale model!